The elevated freeways surrounding our downtown are dead zones. On top, you have travelers isolated in their cars while spewing pollution at 70mph. Underneath, the underpasses are even worse. They’re mostly dark, empty and feature the noise of overhead traffic that sounds like a dragon or bear ready to devour us. These spaces elicit our instinctual fear of caves (yes, that’s where bears and wolves nested in prehistoric times.) At 6’6” and 220lbs, I’m bigger than 99% of people and even I’m reluctant to walk under our downtown freeways at night. 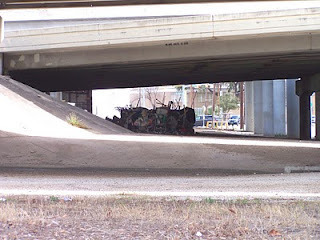 As we look around our downtown, more situations similar to Sunset Station abound: east of Lavaca on Carolina the freeway divides a neighborhood on the ascent from one that isn’t. 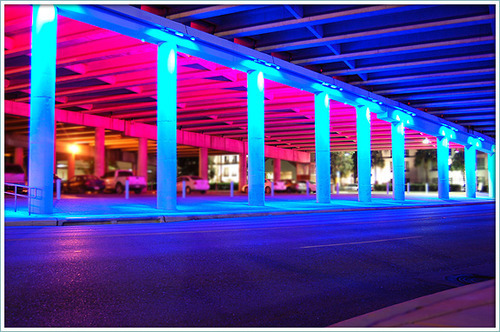 Near Pearl, the elevated columns of 281 create a dead zone where few tread at night. ‘Tear down the freeways’ is a modern urban-planner mantra. That would be a waste as San Antonio is one city in the USA where the 1950s sprawl has actually worked. Our freeway system is terrific and efficient. It works. Removing the freeways would just move those cars to surface streets. Other cities have attempted to deal with the choking effects of legacy downtown freeways. Boston’s Big Dig project is perhaps the most famous attempt to stop the automobile’s destruction of a downtown but is also a glaring example of how the removal of downtown freeways can be a huge mess. San Francisco and other cities claim to have had more success just by moving the traffic from freeways to surface streets as trumpeted by this study from Seattle. However, notice the majority of those cities who have ditched downtown freeways share a common theme: reputations for terrible traffic congestion. But is there another option? Can we take inspiration from a creative approach like New York City and the conversion of the High Line into an elevated greenway? I think so. I propose that we embrace and extend our downtown elevated freeways through an idea I call “Creator-steading.” Much like Oklahoma was born of homesteaders a century ago who migrated with the intention of making big things happen by farming new land, let us use the area under our freeways as an irresistible draw for creators and innovators from across the USA and the world. These people will come in and help grow our ranks of people actively designing new products, starting companies, making art and so on. How would it work? We build basic empty live-work shells underneath the freeway dead zones using the freeway as our already built roof. Make them say 1,500 square feet large. Rent them at a rate well below market to people from elsewhere who submit proposals of what they’ll do in San Antonio. The determining criteria for selection is that selected applicants must be here to take a risk, build something new and add their energy to our community. Be founders of something — an art movement, a gallery, a tech start-up, and so on. Oh, and they have to put down roots here. They must make things happen and be here 320 days a year for five years or they lose their spot. With this, we now have living, breathing spaces underneath our freeways. Our city will suddenly become walkable from downtown to the inner suburbs with our elevated freeways home for artists, designers, small business people and entrepreneurs. And we will attract the types of driven people that San Antonio has been losing to Dallas and Austin for decades. As we are serious about growing into a premier city, those are the people we need.